You know how crazy we are for Pure Glam Volume Root Powder, and we still use it anytime we want major hair volume in seconds. Want some pointers on how to use this amazing Hair Fairy Dust? Here are some tips from stylist pros we use ourselves. Worried about the hot, humid summer coming up? Pure Glam Volume Root Powder creates lift, volume and texture, while also absorbing oils. What a trifecta! 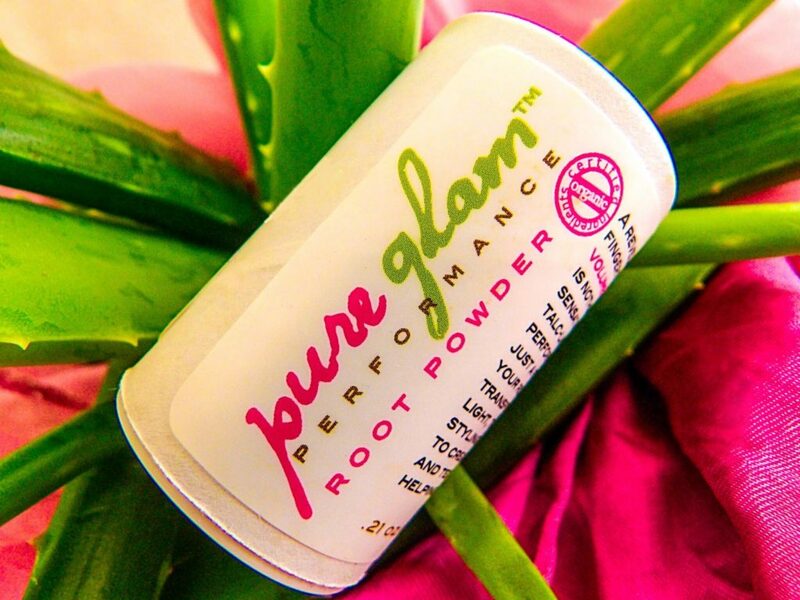 Apply Pure Glam Volume Root Powder at the roots on dry hair for instant volume. Apply all over to add grit and hold before starting an updo. Style Chicks received Pure Glam Volume Root Powder in exchange for our unbiased review and received compensation for our time and effort as Brand Ambassadors. However, our experience with the product and the opinions expressed in this review are 100% ours. We’re mad about Pure Glam Dry Shampoo for getting our hair clean and our scalps feeling great with its’ organic formulation, so you can imagine how excited we are to try Pure Glam Volume Root Powder to get major volume! This hair product is a powder, much like magic Fairy Dust, and it performs as well as the highest quality Fairy Dust. The stuff you get straight from your Fairy Godmother that she made herself, not mass marketed Fairy Dust. We’re talking instant, major volume, and only where you want volume. It is a small container at .21 oz, but it will last you a long time because you need so little of it to work. My first test was simple: sprinkle it along my middle part. I didn’t expect a lot of volume from the middle. It sprinkled from the container slowly and gently, so it was easy to control where it landed. This is also a nice feature because it negates clumps of product landing in one spot, which is a problem I have had with other volume powders. It seemed to disappear into my dark hair immediately, unlike powders that stay a chalky, dusty white. I started lightly massaging the area, and the powder felt almost like a styling paste consistency without the gunky feeling. It quickly “dried down” and didn’t feel like I had product in at all. The result? It is like I had the hair of my teens, in 20 seconds flat (no pun intended. My hair was the opposite of flat.) The Root Powder gave me gorgeous volume with incredible loft. And it MOVED! Usually, it takes a lot of stiff product to get this much volume, which isn’t a good look. My hair kept its’ natural swing, which is fantastic. As with all Pure Glam products, Volume Root Powder contains certified organic ingredients, is cruelty-free, and is gluten-free! How does Volume Root Powder accomplish all of this without having harsh chemicals in it? With a potent blend of ingredients, including silica silylate, kaolin clay, organic potato starch, organic tapioca starch, organic corn starch, and organic aloe barbedensis leaf juice, you can attain incredible volume in seconds, like you spent hours in a top stylist’s chair! So why haven’t you heard of this amazing product yet? It’s brand new! It’s just been launched for the holiday season, so get yours now in time for upcoming parties! It is absolutely fantastic for getting the proper volume needed for an updo, especially a French Twist. We love this stuff! I was provided with a product sample and compensated for my time and effort. However, all opinions are mine.